SCVHistory.com | Saugus Speedway | Hoot Gibson Says He Has No Assets | AP 9-27-1933. Hoot Gibson Says He Has No Assets. As published in The (Bakersfield) Californian | Wednesday, September 27, 1933. Los Angeles, Sept. 27. 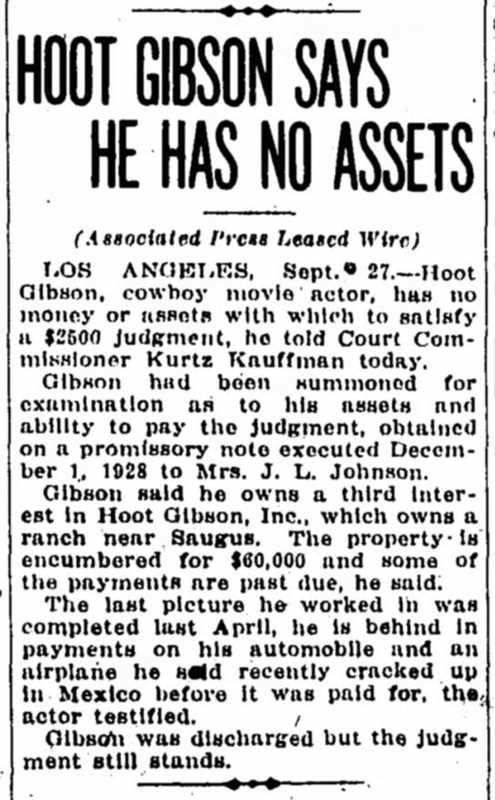 — Hoot Gibson, cowboy movie actor, has no money or assets with which to satisfy a $2,500 judgment, he told Court Commissioner Kurtz Kauffman today. Gibson had been summoned for examination as to his assets and ability to pay the judgment, obtained on a promissory note executed December 1, 1928, to Mrs. J.L. Johnson. Gibson said he owns a third interest in Hoot Gibson, Inc., which owns a ranch near Saugus. The property is encumbered for $60,000 and some of the payments are past due, he said. The last picture he worked in was completed last April, he is behind in payments on his automobile and and airplane he said recently cracked up in Mexico before it was paid for, the actor testified. Gibson was discharged but the judgment still stands.